18k white gold, 24k gold, diamonds, toughened glass dome, glycerine, marine sealant. 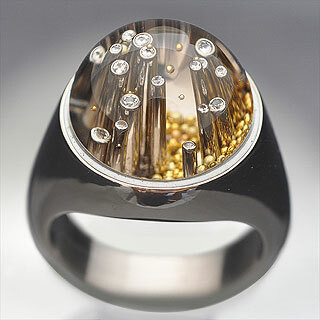 I'm thrilled that my Metropolis Snowglobe ring won second place Gold/Platinum in the 2009 Saul Bell Design Award. The yellow gold snow balls swirl around the diamond tipped buildings as the ring is worn. Engraved oxidized sterling silver, 18k yellow gold, beryllium treated orange sapphires. This cuff bracelet is based on the beautiful frangipani or temple tree. 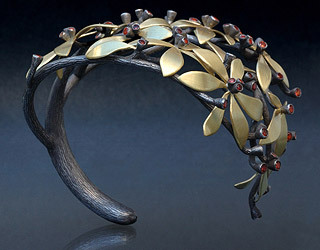 I was delighted when it won two design awards - first place in Jewelry Artist Magazines' 2008 Jewelry Arts Awards Bracelet division and first place in A&EMetal's Explorations 2007 Contemporary jewelry competition. Here's the advert Rio Grande are running this year. It's exciting to see my work and a heavily pregnant me in the trade journals! Thank you to all at Rio Grande, the ad looks great. Click the thumbnail to view the ad. 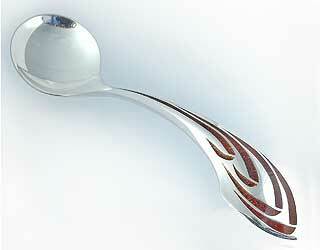 I designed and made this sugar spoon for the 2006 Memento Awards. It won best Memento of Queensland, sponsored by Tourism Queensland. It is made from solid Australian tarnish resistant sterling silver and the sugar cane leaf design is inlaid with dark brown Queensland sugar and resin. Sugar is one of Australia's most important export crops and a vital industry for Queensland which produces about 95% of Australia's raw sugar. Queensland's warm sunny weather provides ideal growing conditions for sugar cane and the industry is at the heart of many Queensland communities. The tropical grass grows on family-owned farms which stretch along Queensland's beautiful coastline, providing a livelihood for many Queenslanders.